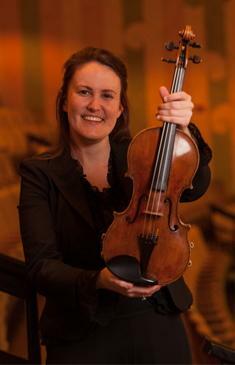 Dr. Jeanne Bourgeois Swanson has been Assistant Concertmaster of the Spokane Symphony Orchestra since 2008. 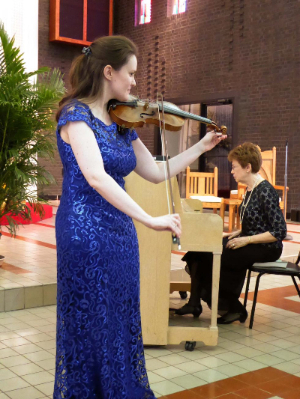 She has a doctorate in violin performance from the Eastman School of Music, a masters from Northwestern University and an undergraduate degree from the Cincinnati College-Conservatory of Music. Her teachers include Charles Castleman, Almita and Roland Vamos, Kurt Sassmannshaus, Piotr Milewski, Thomas Wermuth and Elmira Darvarova. Jeanne has previously held orchestral positions with the Syracuse Symphony, Sarasota Opera, Utah Festival Opera, and the Civic Orchestra of Chicago. 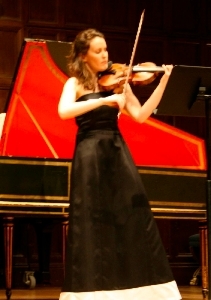 She was Associate Concertmaster of the Illinois Philharmonic Orchestra and has also served as Concertmaster of the Spoleto USA Festival Orchestra in Charleston, S.C.
As a soloist, she has performed with the Spokane Symphony Orchestra, Starling Chamber Orchestra (Cincinnati), Spokane Youth Symphony as well as the West Suburban Symphony Orchestra (Chicago). She is on the substitute list with the Seattle, Vancouver and Oregon Symphonies. 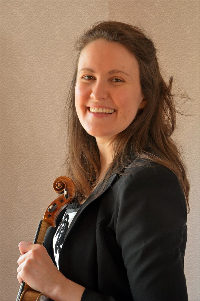 She has taught at Eastern Washington University, Whitworth University, is currently on the faculty of Washington State University String Camp and also maintains a large private violin and viola studio in Spokane. In her free time, Jeanne enjoys the great outdoors, cooking and traveling with her husband, Stephen Swanson and daughter, Roslyn. She plays on a Henricus Catenar violin (1670) and an A. Vigneron bow. Dr. Jeanne Bourgeois Swanson has been teaching for over a decade and enjoys working with students of all ages and abilities. 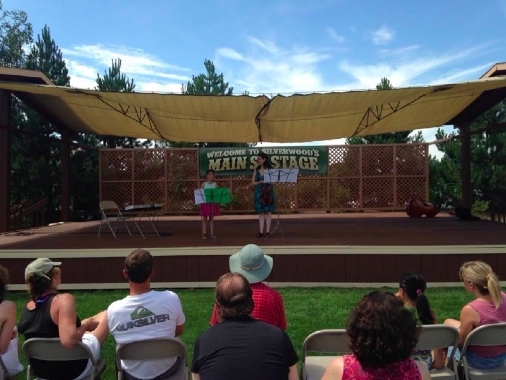 She maintains a studio of 15-20 students and holds three student solo recitals each year, including a fun summer recital at Silverwood Theme Park in Athol, Idaho. 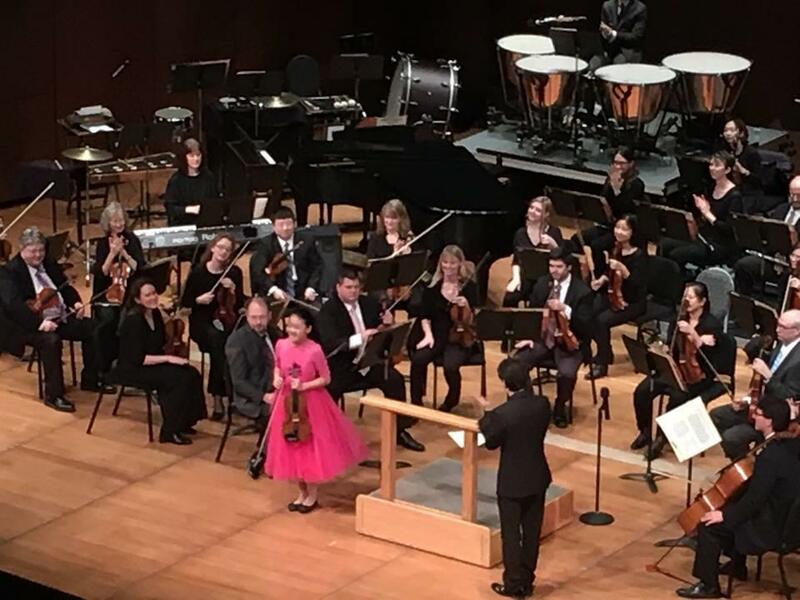 Her students are active members of many school orchestra programs and the Spokane Youth Symphony; and have received awards in Musicfest Northwest, the SYSO concerto competition, and other local competitions. She teaches private violin and viola lessons at her home studio in Spokane's South Hill neighborhood. 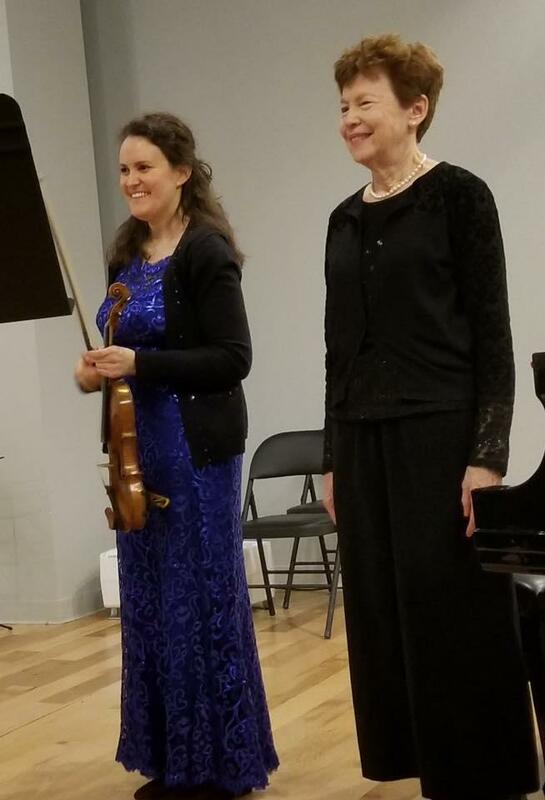 Jeanne's early music training began at age 4 through the Suzuki method with Virginia Burd in Park Forest, IL and she continued her studies at the Western Springs School of Talent Education with Thomas Wermuth. 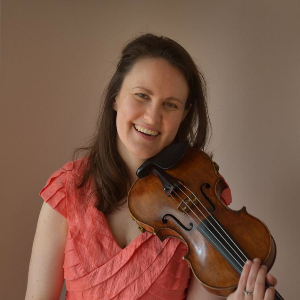 She has received a Bachelors of Music, Masters of Music, and Doctorate of Musical Arts degree in violin performance from Cincinnati CCM, Northwestern University, and Eastman School of Music, respectively. Jeanne is a certified Suzuki instuctor and has studied with renowned Suzuki pedagogues including Edward Kreitman, Linda Fiore, and Allen Lieb. She remains an active member of the Suzuki Association of the Americas. Prior to moving to Spokane, Jeanne taught privately at the Western Springs School of Talent Education (IL), the Eastman Community Music School (NY), and the Hochstein School of Music and Dance (NY). Jeanne is committed to K-12 music education and has coached strings in Spokane's District 81 public school orchestra programs through the Young Musicians Education Program with the Spokane Symphony as well as visited elementary schools through the Holy Names Music Center's Music Support Team. She has coached sections in the Spokane Youth Symphony and continues to serve on the faculty of the Washington State University Cougar Summer String Camp for students grades 7-12. Please contact her for more information about private study. Photo: Jeslyn Cai after her Suzuki Book 5 solo recital at Steinway Piano Gallery. Jeanne has enjoyed performing recitals and for special occasions throughout the Northwest. She is available for solo performances as well as organizing a small chamber ensemble. Jeanne collaborates regularly with many of her colleagues in the Spokane Symphony. Please contact her to schedule music for your special event today through event booking. 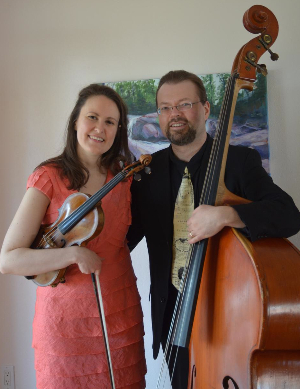 photo above: Jeanne and her husband, Stephen Swanson, perform a concert of works for violin and viola da gamba. Congratuations to Sky McCauley, Helen Knaack, and Charlotte Burns on winning individual achievement awards at the Spokane Youth Symphony concert, May 21st. Congratulations to Jeslyn Cai on winning a silver medal in the Czardas competition at Musicfest Northwest! 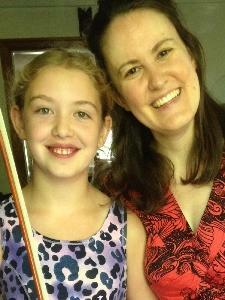 Photo above: Jeanne with dedicated violin student, Helen Knaack, after her Suzuki Book 3 violin recital. Cancellation Policy: No refunds will be given for missed lessons. If your child is sick or there is an emergency, please notify me as soon as you are aware of the situation. Lessons cancelled less than 24 hours in advance may be rescheduled, but not refunded. 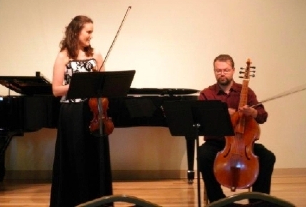 Recital Fee: A recital fee of $40 per family, per year is used to cover hall rental/accompanist fees as well as recital related expenses for the winter and spring student solo recitals and performance classes. Tuition: Tuition is to be paid monthly. At the beginning of each month, I will give each student an invoice that includes all lessons and supplies. The tuition is then due the following week. Late tuition payments of more than 1 month will be charged a late fee. Payments may be made by cash, check, or money order. 1. Please come to all lessons prepared and on time. When students arrive late, I cannot make up the lost time. Also, please wait until your assigned lesson time to enter our studio. 2. Please bring all materials with you to each lesson. This includes your instrument, shoulder rest, rosin, all music and your weekly practice log. A daily commitment to practice is required of all students. 3. Listening to classical music is essencial to classical music study. In addition to focused listening time, listening can be done while riding in the car, eating meals, doing homework, or at the beginning and end of the day. 4. Siblings are permitted to attend the lesson as long as they do not disrupt the learning process. Parents, please limit distractions during the lesson; this includes coming and going, etc. 5. Please do not bring sick students to my classroom for lessons. If your child has stayed home sick from school, please do not bring them to lessons that day. I will do my best to schedule makeup lessons as time permits. 6. Please silence all cellular phones during lessons and do not answer calls. If it is an emergency, please take the call outside, not in the hallway. 7. Learning to play an instrument well takes time. It is about the journey - the process. I believe that if the right path is followed, the results will be there. The harder a student works, the more quickly he/she will improve. 9. Please attend live performances as often as possible. Attending concerts can be an awesome experience for you and your family. The Spokane Symphony performs weekly concerts in downtown Spokane at the Martin Woldson Theater at the Fox. 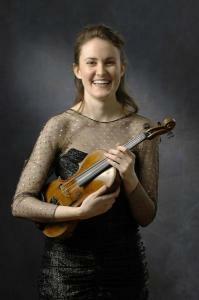 Dr. Jeanne Bourgeois Swanson offers fun beginning violin lessons for students ages 3 and up. Using the philosophy of Shinichi Suzuki as well as renowned traditional violin pedagogues, these lessons are designed to develop a healthy physical set-up for playing along with sound rhythmic and aural skills. The student will be asked to name notes on the staff, demonstrate rhythmic patterns, vocally match pitches, as well as recognize and sing various intervals. Each student will need a parent present at all lessons who is also expected to fully participate in daily practice at home. Students may enroll at any time during the year. Listening to classical recordings and attending concerts is of primary importance for all levels of study. Our goal is to nurture a love for music in each student that will continue for a lifetime. Why is the bow hold so important? The modern bow hold, also called the Franco-Belgian bow hold, was developed to provide for maximum flexibility and control. The hand is to be rounded, much like as if you are holding a fresh egg in your hand. First, relax your wrist and let the fingers and hand hang towards the floor. Then form an oval between the 2nd finger (middle) and thumb. Now insert the bow into this circle. All of the fingers rest on the stick: the 2nd and 3rd fingers stay together, the pinky is placed on the top of the stick and the index finger a slight distance from the 2nd, touching the stick between the first and second joints. The thumb is to be bent and placed inside the bow, pointing slightly upwards towards the frog. The placement of the index finger between the two upper joints allows for extra control and the ability to ‘catch’ the bow for added articulation. A strong pinky is essential to controlling placement and lift of the entire bow. If the pinky should want to fall off the stick, try placing it on the side of the bow closest to you rather than directly on top of the stick. A bent thumb adds additional power to the sound and also allows for extra articulation in advanced strokes, such as down and up bow staccato. The bow hold is difficult for many students to learn since it does not have a parallel in many other activities. Therefore, the teacher will guide the student in their bow hold development for much of the first few years of private instruction. I often enjoy watching the violin soloists bow holds who come to play concertos with the Spokane Symphony. Everyone has a slightly different bow grip. However, certain principles are always evident, including a combination of strength, balance, and most importantly, flexibility. Joachim bowed with his index finger lifted off into the air, Ysaye often had his pinky raised above the bow, and Sarasate played freely and expressively with all fingers on the stick. -Leopold Auer, he insisted that there should be no rule for how to hold the bow. Skype violin lessons are now available. Study music anywhere in the world! 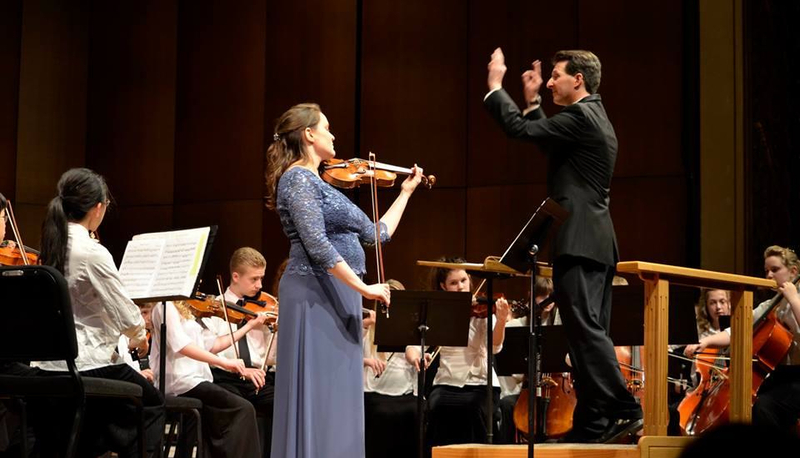 Photo: Jeanne performing with Spokane Youth Strings and Sinfonietta with SYS conductor John Marshall. Tuition may be paid by cash/check or by credit card through PayPal. When using PayPal, 4% is added to your lesson to cover PayPal fees. Photo: Jeslyn Cai plays Vivaldi 'Summer' from 'The Four Seasons' at the Spokane Symphony education concerts in October, 2016. 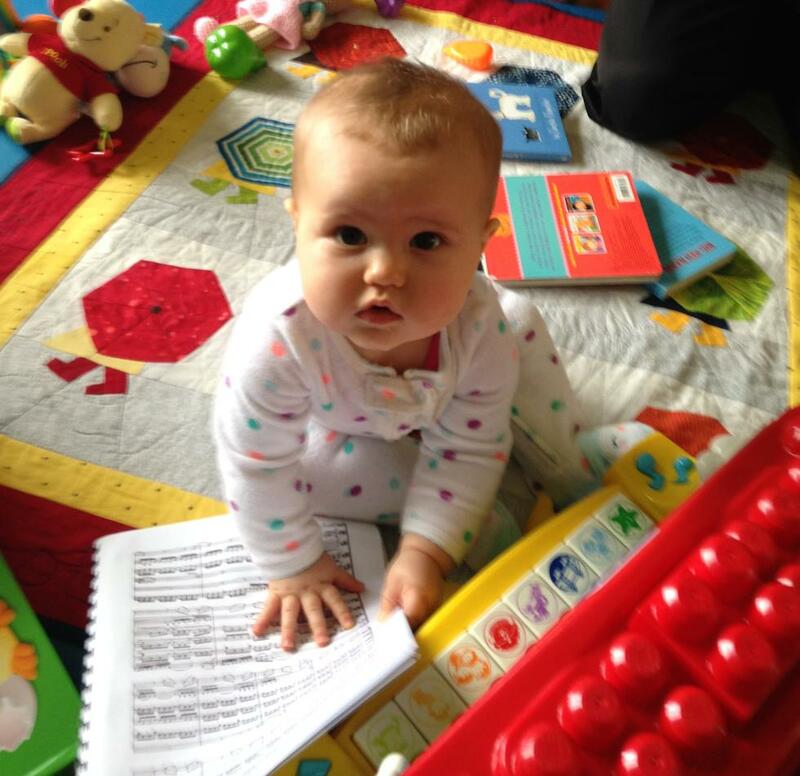 Music classes for babies and toddlers and their caregivers. Enjoy making music together! Sing, dance, play handheld percussion instruments, and learn the basics of musicianship. Lessons tailored to each student's interests and abilities. Lessons may include introduction to notereading and music notation, ear-training, and basic rhythmic studies. Lessons are taught as private or small group lessons. Music is a life-long journey and we enjoy teaching and sharing music with adult students. I am happy to help guide your studies whether you are beginning the violin/viola, returning to your instrument after many years or have played throughout your life. We offer flexible scheduling and lessons may be as frequent as works with your schedule. We offer adult music soirees for adults to meet and perform for like-minded students and share their experience over an evening of hors d'oeuvre and wine. Small chamber groups may be organized as well along with information on community orchestras and amateur music festivals around the country.